Researchers, doctors, and medical experts have been watching the rate of C-section deliveries rise consistently for the last decade. While the World Health Organization suggests maintaining a combined worldwide C-section rate between 5 and 15%, southern Italy is not falling within that range. 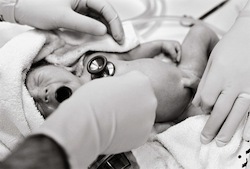 As of 2008, an estimated 38% of pregnancies ended in C-section deliveries. Surgical risks are a concern, but researchers at the Department of Biosciences in Italy are more concerned with the rate of C-section deliveries among women who want to birth naturally. Study authors collected information from 2.474 women who participated in the ISTAT (Italian National Statistics) survey. Total C-section rate among the information studied was 35.5%, on par with the 2008 rate. However, when researchers looked into women who wanted to give birth naturally they found more than 30% of those women ended up having a C-section. Among the elective C-section population, women were more likely to live in southern Italy or be 35 years of age or older. Conclusion: Overall, researchers found that women living in southern Italy who receive private medical care for pregnancy are more apt to have a C-section delivery, even if natural birth is the preferred option. Education about the risks associated with surgical delivery combined with reinforcement of maternal birth choice in cases where natural birth is safe are critical to reducing the total number of C-sections in southern Italy. Source: Barbadoro P, Chiatti C, D'Errico MM, Di Stanislao F, Prospero E. Caesarean Delivery in South Italy: Women without Choice. A Cross Sectional Survey. PLoS One. 2012;7(9):e43906. doi: 10.1371/journal.pone.0043906. Epub 2012 Sep 17.